Can I squeak in under the wire with our Halloween pumpkins? 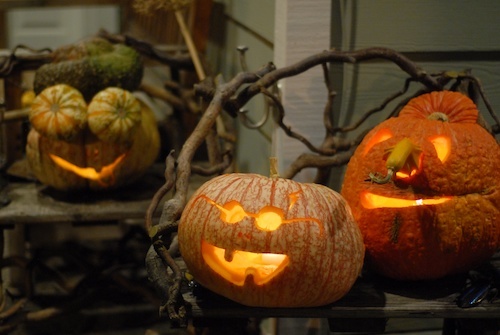 Mine’s on the left with gourd eyes, our exchange student contributed the Harry Potter in the middle (his first pumpkin-carving experience) and my husband carved the one on the right. On the October pumpkin theme, I made a few batches of Pumpkin Chia Chocolate Chip Cookies from Purely Twins. While I made a few substitutions, basically it was still their recipe (which unfortunately seems to have disappeared from their blog). 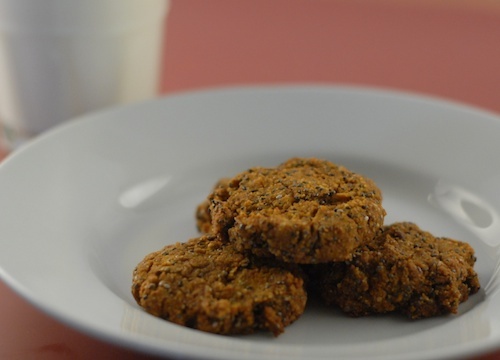 The cookies are gluten-free, whole grain (with a little starch) and use coconut sugar for the sweetener. I’ve tried them both with the amaranth flour that Lori and Michelle call for and with a homemade mix of brown rice flour, white rice flour, and almond flour. I liked it both ways, though I’m still getting a little used to the flavor of the amaranth flour. I also used tapioca flour instead of arrowroot and did not use stevia. The twins are accomplished, creative bakers with lots of vegan, gluten-free recipes. and their blog is well worth a visit. Lori and Michelle’s recipe prompted me to buy and use two ingredients I had never tried: chia seeds and amaranth flour. Trader Joe’s now carries chia seeds for a lower price than some. I bought Bob’s Red Mill amaranth flour at my food co-op, but you can also get it on Amazon. Happy fall baking! 2017 Update: I really did like these cookies, I’m going to have to try to recreate them sometime. I didn’t keep using amaranth flour, but chia seeds have become a staple. I use them every morning in my smoothie or breakfast bowl. 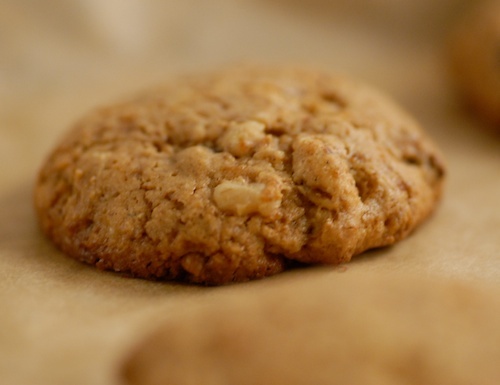 Gluten-free Oatmeal Raisin Walnut Pecan Cookies | Baking with Duck Eggs A little spice, raisins, walnuts and pecans take these oatmeal cookies a few steps past ordinary. So do the duck eggs I used-- they're optional, but they really do add loft to baked goods. Apricot Almond Chia Energy Bars Homemade energy bars better than what you can buy in a store. 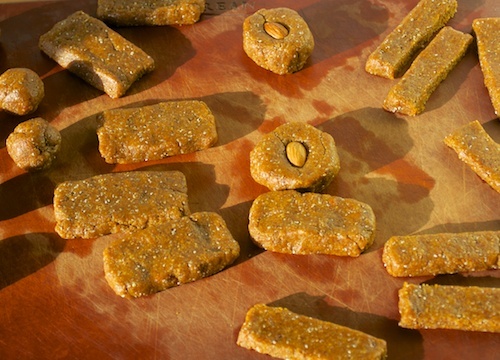 Made with almonds, apricots, dates, chia, cinnamon, cardamom, and protein powder. 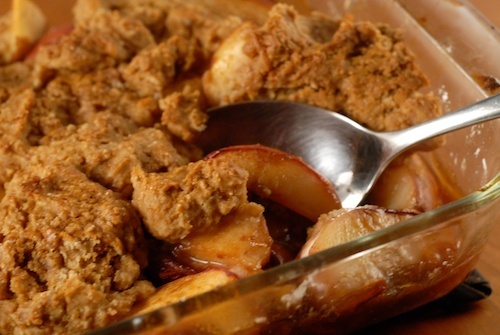 Gluten-Free Vegan Peach Cobbler Peach cobbler-- vegan and gluten-free, with unrefined sugar. 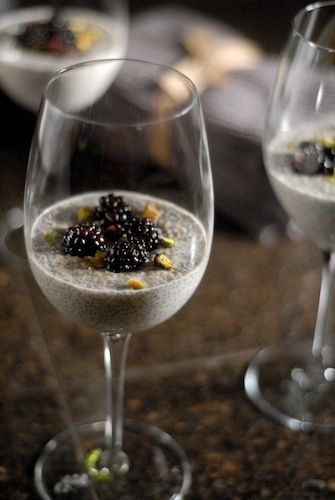 Coconut Chia Pudding A very easy coconut chia pudding dessert. thank you so much for the sweet words and mention!! your cookies look great! enjoy! it took us some time to like amaranth flour for gf baking but over time we learned to love it, hope you do too! They disappeared quickly, I know I will make them again soon. As far as the amaranth flour, I still have most of the rest of bag, so I will definitely be trying it in other baked goods. These sound delicious, Mary! I’ve never tried chia seeds before. They are usually very expensive at most stores, so I will definitely have to see about getting some at TJ’s the next time I’m in there. LOVE the use of chia in this recipe. YUM! Your pumpkins are pretty impressive! I was never very good at pumpkin carving, so we just put them outside uncarved. So boring, right? 🙂 These cookies look like the perfect Halloween treat! I just saw your pumpkins. They are very creative. Thanks, Mom! We had fun making them. Hi Richard. I have to admit that I haven’t used the amaranth flour in any other recipes yet besides this one. It has a distinctive flavor, it’s not the first thing I’d try for someone new to gluten-free.